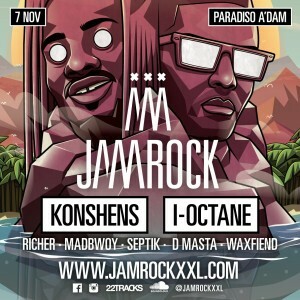 During his one month European tour with Ovaproof Bookings reggae and dancehall artist I-Octane performed at Jamrock Explosion at the Paradiso nightclub in Amsterdam. He delivered a highly energetic performance to the 1500 fans at the sold out Jamrock Explosion. After his show we met up with him while fellow dancehall artist, Konshens, took the stage. One might expect the artist to be tired and longing for a shower and sleep after the show, but not the Hot Rass, he was in good spirits and ready to take pictures and give us an interview. We spoke about the Cyaa Do It song he did with Gaza Slim a.k.a. Vanessa Bling and how that started a rumor about the two having a real life love affair. I-Octane set the record straight about Gaza Slim and himself and spoke about his appreciation for women who are full of morals and don’t give in to temptation to stray when they’re in a relationship. The next day I-Octane, real name Byiome Muir, had a show at Club Empire in Rotterdam. This show was on a Sunday and there were significantly less people, so expectations were lowered. However this show was where I-Octane’s personality radiated. At the beginning of the show he stated: “If it have 5000 people or 50 people inna di place, mi no business, mi come fi perform and mi a give yuh a show!” His words proved true as his performance was in no way less than the one he had given the night before. The experience was actually even better because the scant audience was treated to an amazing performance in such an intimate setting. He performed many hits including “Wine and Jiggle”, “Your Eyes” and “Gal a Gimmi Bun” and just like during the show at Jamrock he invited a lady on stage to dance with him. It was I-Octane’s last show of his European tour and he certainly gave it his all. This entry was posted in Dancehall Artists on December 20, 2015 by AngelMisierBadGyal. Ok then!! Big up the Artist them one time !! That gyal Angel u doing her thing, and she looks good ?